Most of those participating in Hope College’s commencement exercises on Sunday, May 6, knew that they were receiving a degree. Martie Bultman didn’t. 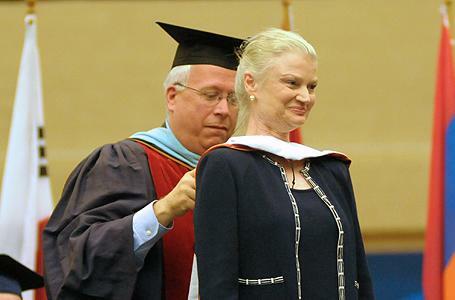 The wife of President James E. Bultman, she received a Doctor of Humane Letters (L.H.D.) degree during a surprise presentation shortly before the 690 members of the graduating Class of 2012 crossed the stage at the DeVos Fieldhouse. The recognition celebrated her distinguished service to Hope and the Holland community and in special education, especially during the past 13 years that she and her husband have been the college’s first couple. Bultman’s honorary degree was one of two presented during the event. As announced in April, the college also presented a Doctor of Humane Letters degree to Joel Bouwens of Holland, a 1974 Hope graduate who chaired the college’s Board of Trustees from August 2003 through July 2011. Bultman and her husband both have been enthusiastic and tireless supporters of students and their activities. Throughout their 13-year tenure, they have regularly attended student scholarly presentations, performances, and competition in athletic events, usually together but sometimes individually when activities happened simultaneously—so at least one of them can be present at each. Together they have served communion during the college’s Sunday-evening worship services in Dimnent Memorial Chapel, and they also break bread with students by joining them for lunch or dinner in the dining halls, or by inviting them for a meal in the President’s Home. As co-advisor of Hope’s Mortar Board chapter, Bultman has been active in attending all of the group’s meetings and was involved in all of the chapter’s many service projects. The chapter has received multiple awards at the Mortar Board National Conference during each of the past several years, including being named the top chapter during the national conference in July 2010. During the summer 2011 conference, the chapter received a “Golden Torch Award,” 12 “Project Excellence” awards, and the second annual “First Book Award” for having been the top chapter in the national “Reading is Leading” Virtual Book Drive Challenge. Bultman graduated from Hope in 1963, the same year as her husband. She majored in psychology and initially taught elementary-age special-education students in the Portage schools. She took some time off from teaching after son Matthew and daughter Heather were born, but stayed involved in the field as adult coordinator for Special Education Ministry in Holland while her husband was back at Hope as a member of the faculty between 1968 and 1985. Based on her work with the ministry program, she co-authored the “Friendship Series,” a religious curriculum for sharing God’s love with persons who have disabilities that is used throughout the English-speaking world and has now been translated into Spanish for use in Latin and South America. She also served the department of education as an observer of student teachers in special education. Realizing that she missed teaching herself, she subsequently taught high school students in Holland’s West Ottawa School District from 1979 until 1985. While in Orange City, Iowa, where her husband served as president of Northwestern College from 1985 to 1999, she was a learning disabilities instructor at MOC-Floyd Valley High School. In addition to her active engagement with the Hope community, she is also involved in service and leadership beyond campus. Bultman is currently serving her third term on the Board of Directors for Friendship Ministries, and served previously on the Board of Trustees of the Ministerial Formation Coordinating Agency and the steering committee for disability concerns for the Reformed Church in America, as well as the planning committee for Western Theological Seminary’s Friendship House. She has also served several community organizations, including as a member of the Holland Area Arts Council Board of Directors and as chairwoman of the Kate Garrod Post Educational Scholarship Fund for the Woman’s Literary Club. She and her husband are also active members of Christ Memorial Church in Holland. Her commitment to special-needs children and service to Hope is celebrated through the Martie Tucker ’63 Bultman Scholarship Fund, established in 2004 by the college’s Board of Trustees and awarded to senior students majoring in special education with preference to those who have served in Holland’s Special Education Ministry Program. This past October, she and James Bultman received the “Hope for Humanity Award” from the college’s Alumni H-Club in honor of their service to Hope. In recognition of their student-focus in particular, the college’s new student center, planned through the “A Greater Hope” comprehensive campaign, will be named the Jim and Martie Bultman Student Center. Even in the 147th year, there is room for firsts. Dr. Sonja Trent-Brown of the Hope College psychology faculty has been presented the 48th “Hope Outstanding Professor Educator” (H.O.P.E.) Award by the graduating Class of 2012.